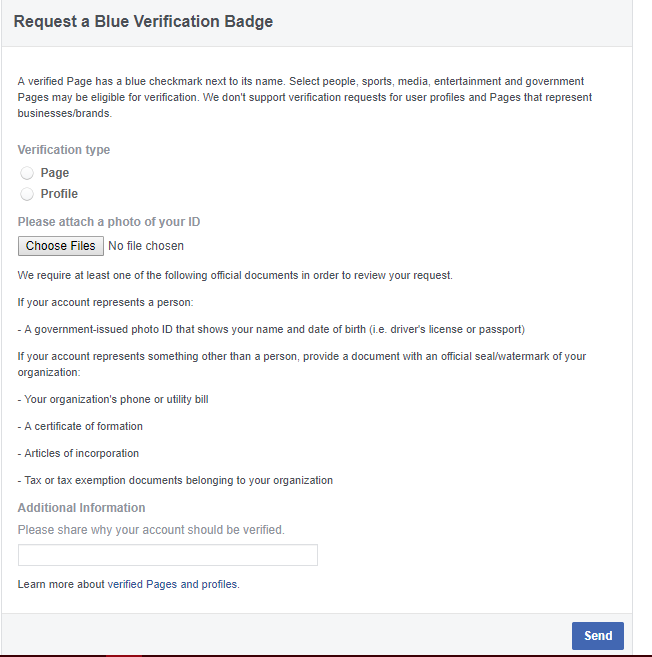 That tiny little Blue Verification badges are given to authentic accounts and pages on Facebook. If you search for an actor on Facebook, you will find tons of pages for that particular person. Now, how will you find the real account and the fake accounts? This is where Verification badges come in handy. By seeing the blue tick mark on the name, you will be able to the right page or account of the original person. 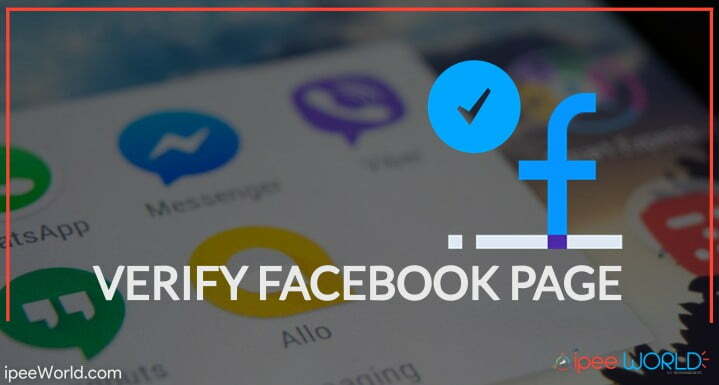 In this Article, you will find how you can verify your Facebook Page or Account. If you are the owner of a particular business or online service then you can ask Facebook to get verified and get the blue tick mark next to the name. And again, if you are a celebrity or a highly popular individual then you can also ask Facebook to verify your Account or Page. There are two types of verification Process on Facebook, one is automatic and the other one is through Manual Request. If you are a Famous Celebrity, Public Figure or Famous Brand, Company etc. Facebook will automatically detect those accounts and verify it. But in other cases, we should submit a request for Verification. 0.1 Why Verify Your Page or Profile? Why Verify Your Page or Profile? You might have observed a small Blue Tick next to the name of a famous brand, person etc while surfing in through Facebook. Those Badges indicates that this page is the Official Page or Account of the Particular Person you Are searching for. For example, if you search Facebook for “Google” you will see a lot of pages with the name Google, But next to the name of the Official account, there will be a blue tick mark. Similarly, When you open a Page or Profile of Famous Brand, Person, etc you will find the same Verification Badge next to the Name of the Page or Profile. Before going in make sure that your account or page meets minimum requirements.. Your Page or Account should be the Official Page of the Company or Person. You should update your “About” details and Add brief Description about your Page. Contact details and email should be accurate. If you fulfill those requirements, it will be easy for Facebook Staff to review your Page or Account. Link to your Official Website or Mobile App. Link to your Facebook Page or Account from the Official Website or Mobile App. Be sure to Add accurate information in About Tab. These are some simple tips to get started with the Verification process. Implementing this idea will increase the chance of Approval and Facebook can determine whether it is the official one or not. All Requests are not Approved by Facebook, They only Approve Pages and Account which are eligible and have much Popularity and Accuracy. It can take up to 60 Days after adding that information to your Page to get verified. Contact Facebook to solve any of your issues. You can send a Request to Facebook to conduct a Review of your Page or Account. All you want to do is fill the Request Form with accurate details and send it to them. The rest will be handled by them. Step 2: Be sure to open this link from the Account of authorized personnel only. Step 3: Select Page or Account and Upload ID Proof and verification letter signed by Celebrity or Brand. Step 4: Fill in the basic details like Profile or Page, Photo of your ID, etc and click on Send button. Step 5: Once you have sent the Mail, you will receive a Mail from Facebook telling whether your Request was Approved or Rejected. When you go through Facebook, you might notice two types of tick marks. One is in Grey color and the other one is in Blue color. Blue Coloured badges represent official account or pages of celebrity, brands, etc. Grey Badges represents verified locations of specific business and organization. Here are some frequently asked questions on getting Facebook Page/account verified. Can I verify my Facebook Profile? Yes, Facebook lets you verify your Facebook account as well. If you are the real person behind your account then you can easily get your account verified. Make sure that you have a good number of followers and decent brand presence to get verified without any hassle. What to do if my request is denied in the first attempt? If your application for verification is rejected, then don’t rush in. Wait for another 30 days before you send another request. If your verification is denied in the first attempt that doesn’t mean that you can’t reapply again. This is how we sent a request to Facebook asking to verify our Facebook Account or Page. If you are a brand or celebrity having thousands of followers, then the chances for getting your account verified is high compared to other people. It is possible to verify both Facebook Account as well as pages. If you wanted to verify a Facebook account then make sure that Followers settings are turned on, only then you will able to submit your account for verification.